Always enjoyed watching videos on your mobile phone whilst you’re on the go? Still, we can be pretty unsure of the video format that’s supported by our mobile phones. If you’re an owner of the Samsung Galaxy S series, read on for more information about the type of videos that’s compatible for playback with your specific model of phone (i.e. Galaxy S8, S7, S6). Basically, you can watch any MP4, WMV or AVI video files on either of your Galaxy S8, S7 or S6 mobile phone. Those are the more common or popular file formats used and it can be playback on most applications. The best video setting for the three different Galaxy S models only differs slightly in terms of resolution. Others such as frame rate, bit rate, channel and etc remain the same in an MP4 container. Don’t be surprised that sometimes our supported (or as claimed) video files are not recognized or compatible for playbacks. The primary reason is due to the codec differences used to store either the video or audio file. It’s more time consuming and difficult if you don’t know which particular settings to adjust for your videos. In that case, you might wish to convert it with the Wondershare UniConverter (originally Wondershare Video Converter Ultimate). 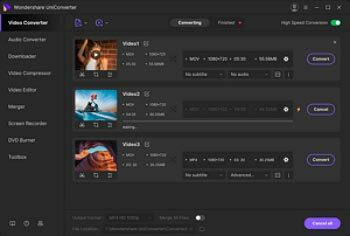 Wondershare UniConverter (originally Wondershare Video Converter Ultimate) offers a huge range of preset output formats ranging from different mobile devices to games and consoles as well as the favorite format of file types. As a Samsung Galaxy S user, you can easily browse to select your choice of mobile phone from the Output Format>Device>Samsung. Just click on your type of mobile and you’ll be able to view the best video format meant for your device.